New 'Easy Calendar' iPhone App Promises Less Hassle in Keeping a Calendar - Easy Calendar released a new week calendar iPhone app which, more than existing iPhone calendars, distinguishes between frequent and less frequent tasks. By significantly lowering the number of steps required to enter a typical appointment, it increases the usability of an iPhone as a day-to-day calendar. Easy Calendar integrates with the iPhone native calendar, by which it fully benefits from standard synchronization features. An interesting feature is the way events can be moved quickly using the week view itself. Easy Calendar released a brand new week calendar app that is all about making it easier and quicker to add and edit appointments in the iPhone calendar. It does this by distinguishing between frequent and less frequent tasks. With most calendar apps, one has to navigate through multiple screens to create an appointment. Easy Calendar uses a single screen that requires just three taps to add a new entry. Always having your calendar with you is one of the obvious attractions of having a smartphone. Because it is one of the most commonly used applications, the actual usability of such apps deserves more than average attention. “I left my handwritten calendar at home since I got my Palm PDA in the late ‘90s,” says Jos Jong, one of the creators of Easy Calendar. ”With that experience in mind, all current iPhone calendars were too much of a struggle to me. They seem not to be designed around a typical situation with somebody on the phone or face-to-face. In most cases, it should be enough to tap on a day, select a time, and enter a short text,” he continues. Accidentally discussing these thoughts with his nephew, Tom van Zummeren, a software engineer, spontaneously led to a family business. “I never bothered to keep a calendar on my iPhone because it was too much of a hassle,” Tom claims. “We both recognized there was value in something really simple to use.” Tom’s brother, Jim, a graphical designer, was added to the team eventually. Their cooperative design follows the 80/20 rule: simplicity at its core, but still possible to access advanced features like repeating events or setting an alarm when required. Easy Calendar is a week-view-only design that works best for people that keep not more than a few appointments per day (not a fully loaded business schedule). 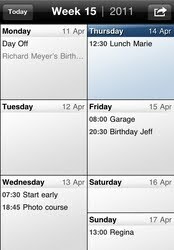 Because it integrates with the native iPhone calendar, it benefits from iTunes and MobileMe synchronization. An interesting feature is the way events can be moved. One can actually browse through the calendar itself to select a new date. This works better than with other calendar apps because it shows you the existing appointments instead of the typical date selection wheel. Easy Calendar can be downloaded from the iTunes App Store. The development team can be contacted for support on support@easy-calendar.com.